Searching for a great value on medical device products? 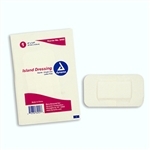 We stock supplies equipment from top brands in every specialty, including Island Dressing 4 X 4 Sterile (indv. Bagged) 6/25/cs, all at great prices. Medical Device Depot seeks to change the way physicians and other health care professionals purchase their medical equipment worldwide by your on- and off-line shopping experience with us worry-free.� Our professional service agents can also answer any questions and address any concerns you may have so you can order exactly what you need, hassle-free.